…is the absolute worst thing I do as a self-produced musician. I spend hours fiddling around with guitar tones. Hours upon hours. It’s no bloody wonder I can’t get anything done. Even when I was in bands if I wasn’t messing with amp settings I was compulsively tuning. Lately, my new thing has been picks. I always go back to the same pick (Dunlop Jazz III, the black one) but I have this container on my studio desk that’s overflowing with just about every pick you can get. I’ve tried them all, and I never like them better than the Jazz III. There’s a part of me that always thinks that the magic ingredient to ‘killer tone’ is possibly one minute detail away. It never is. If I can’t fish a Jazz III out of that bin, I just look at my floor. At any given time there’s probably 10 of them strewn around my studio…from rockin’ out! Postscript: Another old blog post from 2014. For what it’s worth, I still use primarily the black Jazz III picks and they are still strewn around my studio floor. 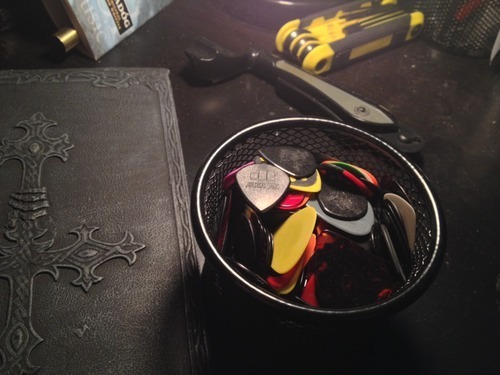 However, I did discover a brand of picks called “Chicken Picks” that are really neat. I may actually try them out on a future recording.